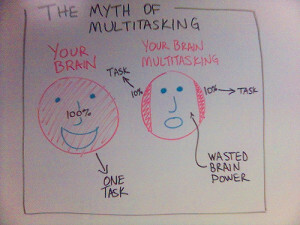 Last week I explored the dangers of getting sucked into the myth of “productive multi-tasking.” Today it’s time for problem-solving so that you (or your clients, family, friends….) are able to resist the siren call of this seemingly plausible approach that trashes the productivity of so many otherwise-smart people. Step 1: Think about what you’ll need – and why you need it. Step 2: Identify your immediate top priority. I’m sure you’ve heard the recommendation to put only your top three priorities on today’s To Do list. However, if you’re prone to trying to multi-task, I’m going to recommend an even leaner approach: Identify and commit to doing the one thing that will do the most to move your business forward right now. Submitting a proposal to speak to a group of your ideal clients, creating a new product for sale, establishing a membership program…Whatever it is, set your sights – and your concentration – on that task and that task only. Now, any important task is likely to involve a lot more than just a single step, and that’s just fine. Yes, your goal is to break the habit of multi-tasking, but that doesn’t mean you can’t shift back and forth between all the myriad activities that relate to your true number-one priority. Your productivity plummets if you lack focus. Step 3: Shut down and/or put away anything that doesn’t relate to your top priority. Yes, that’s just as scary as it sounds. If you’re creating content, close your email program and go offline. If you have to be online for research purposes, open only those windows related directly to your research topic. The idea here is to remove as many potential distractions as possible, so you’re much less likely to be tempted to try splitting your concentration between two or more (unrelated) activities. Step 4: Identify the progress you want to make on this priority today. Given that there are probably a whole bunch of steps you can (and must) take to create a finished product or service, it’s entirely possible you’ll be unable to accomplish all of them in a single setting. So what you want to do is identify what constitutes an acceptable chunk of progress to make, then stay focused on getting to that point. Step 5: Stay fresh and keep from getting overwhelmed by shifting gears deliberately and intentionally. Fortunately, you can address both of these challenges by remembering that you always have the right (not to mention the responsibility) to choose what you deem to be best for your business at this point in time. So, instead of thinking that you have to work on only your top-priority task the whole dang day, remember that staying focused on one important activity doesn’t mean you can’t switch to another important task. This is where your trusty egg (or online) timer can come in handy. If you feel yourself breaking into a cold sweat at the thought of all those other things you’re not working on, you can minimize the stress by making a bargain with yourself: You’ll work exclusively on the project you identified as your top priority until you’ve made a predetermined amount of progress OR until you’ve worked on it for 30 minutes – whichever comes first. Now, 30 minutes may not seem like enough time to make substantial progress on an important project, but it definitely can be – IF it’s 30 minutes of focused, concentrated, purposeful activity. At the end of that half hour, you’ll either find you’ve accomplished what you wanted to (time to celebrate! ), or you’ll be able to give yourself guilt-free permission to switch tasks. The trick here is to be intentional about shifting your focus. If you make thoughtful, conscious decisions about changing focus after you’ve reached an acceptable stopping point on one project, you’ll be much less like to act like a raven distracted by all the bright, shiny objects around you. Step 6: Acknowledge and wildly celebrate your increased productivity. Sometimes I’ll place a piece of notepaper on my desk and jot down every one of the tasks I’ve completed that day. This is an interesting exercise in a number of ways. It always shows me how much I’ve accomplished, even on those days it doesn’t feel like I’ve been hugely productive. Sometimes it shows me I’ve been laser focused. Sometimes it shows me I’ve succumbed to those shiny objects. Does this sound manageable to you? Or does it feel like just one more thing to put on your already-bulging Too Much To Do list? If you’re feeling a little wild-eyed, I have tools and resources that can help. I specialize in working with two types of entrepreneurs: I un-stick those who are paralyzed by overwhelm, and I focus those who are busy busy busy but not terribly productive. Whichever description resonates with you, I can probably provide some sanity-saving tips. But would it be a good idea for us to work together? The only way to know is to get a little bit acquainted with each other through a phone call. At the end of our discussion, we’ll both be confident that we’ve made a decision that’s in everyone’s best interests – whether we start our working relationship right away or agree that we’re not a fit for each other. So…If you think it’s worth exploring whether we’d make a fabulous productivity-boosting team, grab a spot on my calendar for our get-acquainted call, and we’ll see what we see. This entry was posted in productivity and tagged focus. Bookmark the permalink.